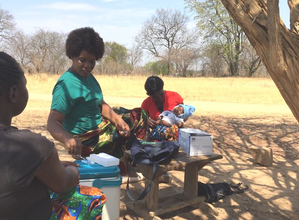 Temperature data loggers are used to monitor vaccine transport and storage in southern Zambia. Temperature monitoring helps evaluate the efficiency of the supply chain through to delivery of the vaccines. Kazungula District in the Southern Province of Zambia has 21 Rural Health Centres (RHCs), and a central pharmacy based in Livingstone that keeps vaccine stock. The RHCs are up to 85km away from the pharmacy, with three at a distance of up to 290km. The roads to the Rural Health Centres are often unsurfaced and this leads to increased journey times. Moreover, typically staff rely on infrequent public transport or taxis to get to Livingstone. Once the vaccines are collected, they travel in an ice-pack lined box for up to 10 hours to get back to the RHC where they are stored in a vaccine fridge with temperatures checked twice daily. A few times a month the vaccines are taken out further to outposts on immunisation days in the ice-pack lined box and then any unused stock is returned. It is therefore clear that maintaining the cold chain is a challenge for health workers, threatening the effectiveness of the vaccines. WHO recommendations state that vaccines should be kept within a range of +2 to +8°C during storage and transport and until the point of administration. Camillo Lamanna, a UK-based doctor, is a co-founder of Tessellate, which is running a pilot Project in the region to increase efficiency in the supply chain, therefore increasing immunization rates and reducing stock wastage. The Project is being funded by D-Prize, a global social entrepreneurship organization. The Project began with an initial 3 month pilot to create an online stock tracking/inventory system for vaccine supplies, aiming to reach a total of 15,000 children. As part of this pilot, Gemini Data Loggers supported the Project with the supply of 21 Tinytag Talk 2 loggers, one for each RHC. The loggers are collected from the central pharmacy and will record the vaccine temperatures during the journey to the RHC, the temperatures in the vaccine fridges, and those on the outreach immunisation days. Once this is complete, a report will be submitted to the Ministry of Health. If the data shows that the vaccines are at risk of being out of range for too long on the transport legs or on the outreach days, Camillo hopes to make a case to the Ministry of Health for a dedicated vehicle for transporting vaccines in Kazungula district and further investment in equipment to preserve the integrity of the cold chain on the outreach days. Camillo comments, "Gemini recommended the Talk 2 data loggers as they have been used with great success by the WHO for many years for this type of monitoring. The recorded data will help provide a clear picture of conditions throughout the supply chain, and will provide a more complete picture than the twice daily manual readings in the fridges at the RHCs." New to Tinytag data loggers? Get started with a Medical Starter Pack.